We are situated less than 30 miles north west of London within easy reach of the M1, M40 and M25. 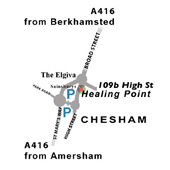 We are located at the North End of the High Street opposite Sainsburys and The Elgiva Theatre. There is inexpensive Public Parking available nearby. See the map on the right. To contact us, please telephone 01494 792 143 during normal opening hours, Monday to Friday.